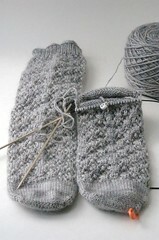 The first sock is sock #2 of my Snowflake Lace socks that were started back in January. All I have left is the leg, so hopefully it wont take me until January of next year to finish the pair. 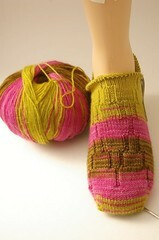 Sock #2 is the Vesper sock with the afterthought heel. 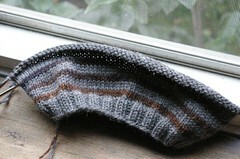 I’m about halfway down the foot of sock #2 but I forgot to take a picture. Sock #3 is the sock I just couldn’t resist, the K1C2 Ty-Dy sock yarn. I’ve worked on it quite a bit so I’m up to the leg now. The pattern is something I made up on the spot, just a simple rib here and there to make it more interesting. I cast on yet another project a few days ago. DH has been wanting a hat for a while and after showing him a couple pattern he decided on the Turn a Square pattern by Jared Flood. I picked up 2 skeins of Silk Garden for him to choose and a skein of Ella Rae Classic as the contrasting color. I couldn’t really figure out how to work the jogless stripe so I am working it as is. I have enough yarn for another hat so I’ll figure it out by then. 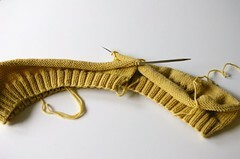 It’s a very quick knit and will probably work on it exclusively until it’s done. Hopefully by this weekend! Before I cast on for the hat I got a bit of progress done on my Calvert, I have about 4 inches done on it. I don’t get to knit very much, maybe one hour at night and I don’t knit very fast, so this last project is pretty long term! The Sock You Just Couldn’t Resist is really, really great. My new TyDy is sitting on my desk very alluringly right now! Five different projects at once, your crazy. I only have three at once, anymore and I would be crazy. Good Luck! The hat looks great. All the socks look great! You should write up that pattern you are making.